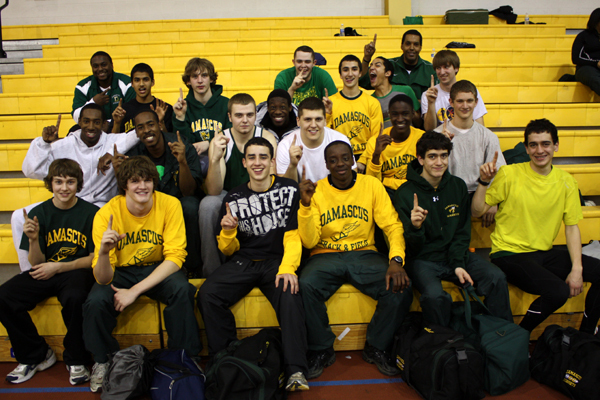 The Damascus boys were dominant in winning their first ever indoor county title. 24 points separated them from second place Walter Johnson (86-62). 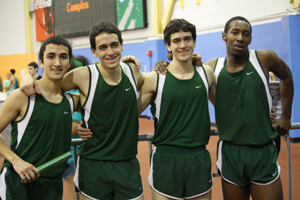 Damascus team members were the only athletes to break a male county record. The 4x800 relay started off the meet with a record time of 8:04.18. They broke the previous record by 1.75 seconds and won the race by 11.16 seconds. Thomas Arias ran a personal best time of 1:58.11 in the 800 which broke Chris Moen's county meet record by 0.38 seconds. Sam Martin of Richard Montgomery ensured a fast pace by pushing the first 200 meters in 28 seconds and the first 400 in 59 seconds. Arias took over the lead after the second lap, but Martin, who was fresh and running his first event of the day, fought back to regain the lead. 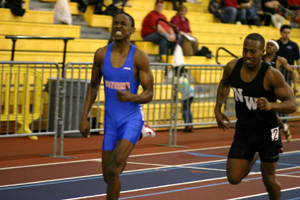 The two exchanged leads two or three times over over the third lap. Arias had a strong kick to run away with it on the final lap in record time. Also contributing to Damascus's team victory was their 4x400 relay which won by about three seconds in 3:30.71, just missing their own county meet record, and their 4x200 relay which placed fifth in 1:35.46. In addition to the Damascus relays, eleven athletes scored across seven of eleven open events. 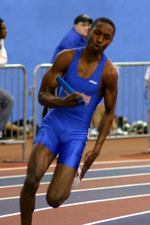 Scoring members aside from Arias included Anthony Blocker in the 55, Joel Ross in the 300, Ben Constantinides and Denzel Woode in the 1600, Jon Constantinides and DeVante' Thomas in the 500, Jon Constantinides in the 800, Kevin Sanders and James Bartlett in the high jump, and Jake Furr and Kevin Mattingly in the shot put. After Sanders was eliminated in the high jump after clearing 5-08.00, only two Gaithersburg athletes remained, and Coach Nathan Parry was left with a difficult decision. He decided to pull Alimamy Kallay from the high jump to save his legs for other events and let Zach Fetters continue jumping. Ironically, Fetters missed his next three attempts and Kallay won the county title with fewer misses at previous heights. Although Kallay would have liked to see how high he could have gone, things worked out for the best. After winning the high jump by default, he placed second in both the 55-meter dash and the 55-meter hurdles before winning the triple jump in 42-07.25. He was the only male athlete to win two county titles and he scored 36 total points by himself. Gaithersburg would place third with 58 points. 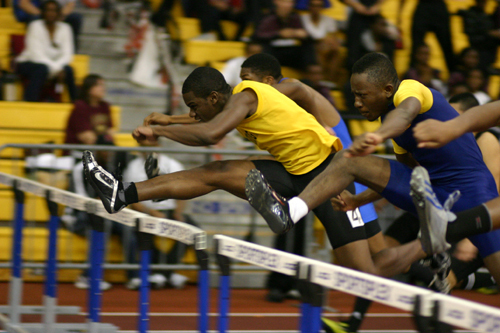 Winning the 55-meter hurdles in 7.86 was Kallay's teammate Trevon Carroll. Not many people knew much about Carroll or predicted him to win based on his Montgomery Invitational time of 8.08, but he is actually the top returning 110-meter hurdler in the county with a best time of 15.06. He looked strong at the first developmental meet with a time of 7.7h, and repeated that here at the county championship. He got out to a slow start, but powered ahead of the crowd and won by 0.09 seconds. 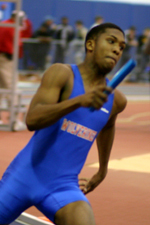 In the 55-meter dash, it was Kallay who got out to the best start, but Hassan Dixon of Northwest and Brandon Addison of Watkins Mill chased him down for what appeared to be a tie as far as the eye could see. Luckily for us, the photo finish sorted out the results. Dixon was deemed the new 55-meter county champion with a time of 6.55, while Kallay clocked 6.56 and Addison clocked 6.57. It doesn't get much closer than that! 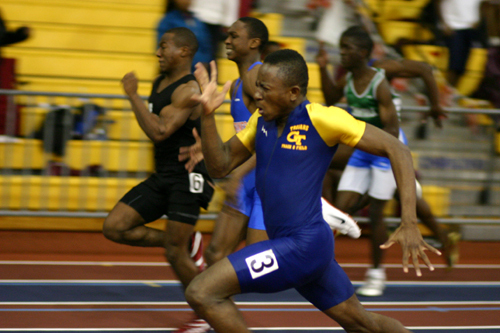 Kennedy's Bisi Ezekoye was the defending champion and the favorite to repeat, but he pulled his hamstring in the preliminary rounds just after crossing the line. He started in the finals, but pulled up short holding his hamstring just as soon as the race began. 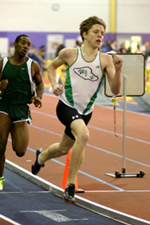 Because of this, every single male county champion in 2010 was a first time indoor county champion. Only the Damascus 4x400 repeated. The 55-meter dash was actually the second time of the meet that Dixon and Addison faced off in a very tight race. The two met earlier in the final section of the 300-meter dash for one of the best races of the day. Clarksburg's Devin Moreno got out fast and looked like he was ready to pull an upset, but Dixon and Addison powered past him on the third curve. Dixon had a slight lead in the final 50 meters, but Addison kept his legs driving and moved by Dixon to win in 35.80. Dixon clocked 35.97 as he fell to the track after crossing the line. 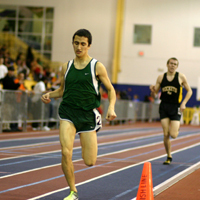 Moreno was third in 36.81 and Martin Dally of Walter Johnson was fourth in 36.85. Dally came back after a short rest to compete in the open 500 where he was considered the favorite. Dally hung way back behind the leaders for the first 300 meters while Jakob Lizon of Magruder pushed the pace. With 150 meters to go, he surged into the front and opened a large lead. He won the heat by 1.45 seconds in 67.05. Rodney Kizito finished third overall in 68.50 while Jon Constantinides finished second overall out of a different heat in 68.45. 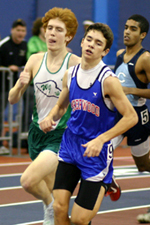 Dally's teammate Sean O'Leary also won his first county title. Not satisfied with the pace of the first quarter mile, O'Leary challenged for the lead on the third lap. From that point on, he pushed the pace and strung out the pack, pulling further and further away. On the final lap, the crowd notified him that Jackson Reams of Sherwood was closing fast and he kicked it in for the win in 4:31.21. Reams was second in 4:32.78. 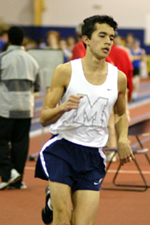 Nicolas Escobar made it look easy in the 3200, but in the end, his opponents did not finish far behind him. He pushed the pace from the first lap and at one point had nearly a ten second lead over anyone else. He won in 9:47.32, but Ishan Dey pulled into second place not far behind in 9:50.59, just ahead of Tarek Elhage of Churchill in 9:50.65. O'Leary doubled back from the 1600 to finish fourth in 9:53.22 while Churchill sophomore Zach Weinstein clocked 9:58.78. Dally, O'Leary, Dey, Alex Willett, Nicholas Regan and a 4x800 and 4x400 relay combined for 62 points for Walter Johnson, which was good for second place. The Watkins Mill 4x200 relay was as dominant as they were expected to be in the end, but they received an unexpected challenge from Churchill. Damiete Roberts, who scored in three other events including third in the 55-hurdles in 7.97, sixth in the long jump and fifth in the triple jump, led off for the Wolverines. Churchill sophomore Micah Phillips-Spencer kept pace through the first leg. Churchill's Zach Raker was ahead of Watkins Mill at the break and and held on to a slim lead through the exchange. Watkins Mill's Abdul Mohammad pulled about even with Churchill at the exchange before William Yougnia took over the lead. Churchill's Robert Bowie didn't give up much ground. The 300-meter county champ, Brandon Addison took the baton for the anchor leg and brought home the win in 1:32.97. Churchill, anchored by Jashawn Thomas, was second in 1:34.39. Sheldon Trotman was the county champion in the long jump. He jumped 20-05.75, which, according to the mocorunning database, was his best jump by 1 foot and 8.75 inches. We've been spoiled with 55...58...60 foot throwers over the last few years, but that was truly a rare occurence of throwing talent in a small locality. This year, Matt Gordon of Wootton sat on an "uncomfortable lead" of just over 45 feet after his first five throws. Damascus's Kevin Mattingly and Jake Furr had both thrown further in previous meets, but they settled for second and third at this meet with throws of 44-11.50 and 44-09 respectively. When victory was in hand, Gordon gave a small fist pump and loosened up. He let one fly for a personal best throw of 46-04.00. It was over a half foot better than his previous best. So after three straight years of Sean Stanley and Marcus Brown, the new county throwing king is Gordon. 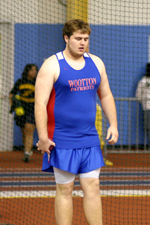 Ironically, it was in the shot put that Wootton had their last individual male county champion. The last time a Wootton male won a county title was when Jared Wasser won the indoor and outdoor county shot put titles in 2003. AWW Dmas Guys are sooooo cute. LOve you guys!!!!!!!!!!!!! !